HOUSTON, March 14, 2013 - Jiffy Lube® International recently named Atlantic Coast Enterprises, LLC (ACE) as Franchisee of the Year. The owner and operator of 50 Jiffy Lube® service centers in Tampa, Miami and West Palm Beach, Florida as well as Myrtle Beach, South Carolina, ACE was recognized for its fierce dedication to the Jiffy Lube system, willingness to help lead and drive innovation and ability to continuously provide an excellent customer experience. 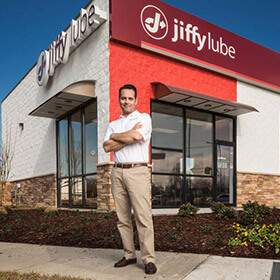 The prestigious Franchisee of the Year award is presented annually to the Jiffy Lube franchisee who best exemplifies the brand and demonstrates ongoing commitment, support, strength and integrity. "ACE embodies the values and attributes that are core to the Jiffy Lube brand, especially when it comes to delivering an exceptional customer experience each and every day," said Stu Crum, president of Jiffy Lube International. "One of the service center managers literally jogs out to greet every customer as they drive up -- that is true passion for the job. I am delighted to recognize Al Chance, Steve Allison, Dan Ramras and the entire ACE team for their outstanding performance. " "This national recognition is an honor. We have owned and operated Jiffy Lube service centers since 2008 and are extremely passionate about providing our customers with an outstanding experience," said Al Chance, CEO of ACE. Steve Allison, President of ACE, added "We have a great team. Each and every ACE employee goes above and beyond to embody the Jiffy Lube brand and help customers Leave Worry Behind when it comes to maintaining their vehicle." Atlantic Coast Enterprises, LLC (ACE) is a Jiffy Lube franchisee formed by the partnership of veteran lube operators Al Chance and Steve Allison, who together have over half a century of experience in the fast lube industry. With 50 stores in Florida and the Carolinas, ACE is one of the largest franchisee companies in the Jiffy Lube network. The company currently has over 600 employees, and continues to grow by hiring and developing the best talent in the industry. Visit www.acejiffylube.com to learn more about ACE, locations and services. About Jiffy Lube International, Inc.
Jiffy Lube International Inc. ("Jiffy Lube"), with more than 2,000 franchised service centers across North America, serves 22 million customers each year. Jiffy Lube pioneered the fast oil change industry in 1979 by establishing the first drive-through service bay, providing customers with fast, professional service for their vehicles. Headquartered in Houston, Jiffy Lube is a wholly owned, indirect subsidiary of Shell Oil Company. Visit www.JiffyLube.com to learn more about Jiffy Lube and vehicle care. This press release contains forward-looking statements concerning the financial condition, results of operations and businesses of Royal Dutch Shell. All statements other than statements of historical fact are, or may be deemed to be, forward-looking statements. Forward-looking statements are statements of future expectations that are based on management's current expectations and assumptions and involve known and unknown risks and uncertainties that could cause actual results, performance or events to differ materially from those expressed or implied in these statements. Forward-looking statements include, among other things, statements concerning the potential exposure of Royal Dutch Shell to market risks and statements expressing management's expectations, beliefs, estimates, forecasts, projections and assumptions. These forward-looking statements are identified by their use of terms and phrases such as ''anticipate'', ''believe'', ''could'', ''estimate'', ''expect'', ''goals'', ''intend'', ''may'', ''objectives'', ''outlook'', ''plan'', ''probably'', ''project'', ''risks'', ''seek'', ''should'', ''target'', ''will'' and similar terms and phrases. There are a number of factors that could affect the future operations of Royal Dutch Shell and could cause those results to differ materially from those expressed in the forward-looking statements included in this press release, including (without limitation): (a) price fluctuations in crude oil and natural gas; (b) changes in demand for Shell's products; (c) currency fluctuations; (d) drilling and production results; (e) reserves estimates; (f) loss of market share and industry competition; (g) environmental and physical risks; (h) risks associated with the identification of suitable potential acquisition properties and targets, and successful negotiation and completion of such transactions; (i) the risk of doing business in developing countries and countries subject to international sanctions; (j) legislative, fiscal and regulatory developments including regulatory measures addressing climate change; (k) economic and financial market conditions in various countries and regions; (l) political risks, including the risks of expropriation and renegotiation of the terms of contracts with governmental entities, delays or advancements in the approval of projects and delays in the reimbursement for shared costs; and (m) changes in trading conditions. All forward-looking statements contained in this press release are expressly qualified in their entirety by the cautionary statements contained or referred to in this section. Readers should not place undue reliance on forward-looking statements. Additional factors that may affect future results are contained in Royal Dutch Shell's 20-F for the year ended December 31, 2011 (available at www.shell.com/investor and www.sec.gov ). These factors also should be considered by the reader. Each forward-looking statement speaks only as of the date of this press release, March 14, 2013. Neither Royal Dutch Shell nor any of its subsidiaries undertake any obligation to publicly update or revise any forward-looking statement as a result of new information, future events or other information. In light of these risks, results could differ materially from those stated, implied or inferred from the forward-looking statements contained in this press release.